From the authors of the #1 New York Times bestseller Rhett & Link's Book of Mythicality and creators of the Internet’s most-watched daily show, Good Mythical Morning, a thrilling and darkly funny novel about two best friends fighting the sinister forces at the heart of their Southern town** It's 1992 in Bleak Creek, North Carolina, a sleepy little place with all the trappings of an ordinary Southern town: two Baptist churches, friendly smiles coupled with silent judgments, and a seemingly unquenchable appetite for pork products. 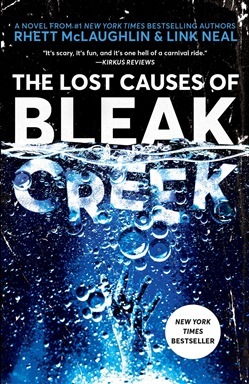 Beneath the town’s cheerful façade, however, Bleak Creek teens live in constant fear of being sent to The Whitewood School, a local reformatory with a record of putting unruly teens back on the straight and narrow—a record so impeccable that almost everyone is willing to ignore the mysterious deaths that have occurred there over the past decade. At first, high school freshmen Rex McClendon and Leif Nelson believe what they’ve been told—that the students’ strange demises were all tragic accidents. But when the shoot for their low-budget horror masterpiece, *PolterDog, *goes horribly awry—and their best friend, Alicia Boykins, is sent to Whitewood as punishment—Rex and Leif are forced to question everything they know about their unassuming hometown and its cherished school for delinquents. Eager to rescue their friend, Rex and Leif pair up with recent NYU film school grad Janine Blitstein to begin piecing together the unsettling truth of the school and its mysterious founder, Wayne Whitewood. What they find, with Alicia's life hanging in the balance, will leave them battling an evil beyond their wildest teenage imaginations—one that will shake Bleak Creek to its core. Acquista The Lost Causes of Bleak Creek in Epub: dopo aver letto l’ebook The Lost Causes of Bleak Creek di Rhett McLaughlin, Link Neal ti invitiamo a lasciarci una Recensione qui sotto: sarà utile agli utenti che non abbiano ancora letto questo libro e che vogliano avere delle opinioni altrui. L’opinione su di un libro è molto soggettiva e per questo leggere eventuali recensioni negative non ci dovrà frenare dall’acquisto, anzi dovrà spingerci ad acquistare il libro in fretta per poter dire la nostra ed eventualmente smentire quanto commentato da altri, contribuendo ad arricchire più possibile i commenti e dare sempre più spunti di confronto al pubblico online.